Dear friends, dear fans – after over 20 years of the bands existence we sadly have to announce that Toxic Smile will be retiring from the stage of the rock circus. More details will be given down below, but for now we want to say a heartfelt thank you to all our companions, partners, our label and, most importantly, all of our loyal fans! Whats going to happen next for all of our band members? 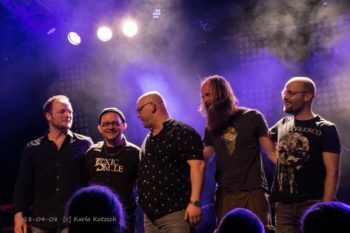 Marek Arnold will be staying faithful to progressive rock, particularly dedicating himself to his bands „seven steps to the green door“ ( www.ssttgd.de ), CYRIL ( www.cyril-band.de ), work on his solo-album as well as albums with Manuel Schmid, Damanek, Flaming Row and as guest musician for several other projects. Furthermore he will be working at his studio „B´side-music“ ( www.bside-music.de ) and, as a saxophonist, continuing to take part in jazz bands such as „Passage“ and others. Larry B. will be touring through Germany with his cover band „Krause-Band“, and will stay active as singer for the Genesis/Phil Collins tribute band „Abacab“. Through „Cyril“, hell also be staying true to progrock. Robert Brenner continues to play and sing in bands like „The Cashbags“, „Quarteto Bando“ and the berlin solo choir under supervision of Christian Steyer. Regarding the „End“ of TS he says: „Alles hat ein Ende, nur die Wurst hat zwei“ ( a saying that applies ). Dresden, will be dedicating himself to entirely new projects such as a self sufficient estate. Toxic Smile was able to sign a contract with a major asian label with the first album, to then experience a short but unbelievable time as „Rockstars“ in Korea, to produce a surely unique and special DVD production with orchestra, and to experience and play at major festivals all over Europe. The majority of our 8 releases have been praised with positive and keen reviews, and we were very lucky to be able to create 5 CDs at Progressive Promotion Records, as well as publish older releases, which is why nearly all releases of Toxic Smile are available on www.ppr-shop.de and many other online shops and retailers. Even though we had major success with the band, the developments in the music industry over the past years haven’t gone unnoticed by us. The majority of us are active musicians, we have founded families, planted trees, opened studios or music schools and engage in a wide variety of musical genres, and have settled down in different parts of Germany. Due to having experienced so many wonderful, fulfilling and exciting years with the band, it kept getting harder for us to find the motivation to continue with our shifted living conditions and circumstances. Work on new material had been minimized to 1 to 2 sessions a year, whereafter it immediately went in production. Thats how the last two surprisingly very esteemed albums were created, which shows that Toxic Smile never lacked musical creativity or efficiency. We were constantly asked to play live gigs, but organizing those was close to impossible. It seems to be common practice these days that bands have to present their own repertoire for free, guarantee a quorum of listeners, take responsibility for technical equipment and room rental, or even booking themselves in for support gigs for better known bands. Even though the reasons for this development (especially the overall decrease of viewer numbers at concerts of less well known bands) are partly obvious: We never signed up for that – especially because of the bands history. At one point, a decision had to be made, and as we published our last album at the end of 2015, which consists of one 42 minute long title, we named it „Farewell“. We are very proud of that album, and even though a following album was nearly all written and recorded – could there be a more classy ending to a career than a silent, or rather loud, FAREWELL? Thank you and to hopefully seeing and hearing each other again on different stages and in new places! We hope we, through our music, could create something worthwhile which will be spreading joy for many years to come. Marek, Brobert, Larry, Stephan und Drobert!